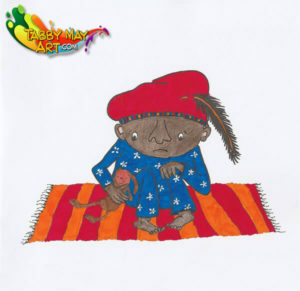 From BBNC I received, on behalf of Kleuren voor Volwassenen, the Dutch children’s coloring picture book Bange Pietje (translated in English: Scared little Pete). Thank you BBNC. The book was drawn and written by Martine van Nieuwenhuyzen. This is the third children’s book that I received lately and in all three of them I’ve colorized a couple of drawings. The third review on these books will be online later this week. (I didn’t translate the first one, sorry). In a brand new blogpost I’ll tell you how I feel about coloring review material for children’s books. The coloring picture book Scared little Pete is 25 x 25 cm size and it contains a story, in text and drawings, to colorize yourself. It has thick, nice white paper. How the several different coloring materials behave on the paper is what I’ve tested for you in three different drawings. But let me give you some extra information about the content of this book first. ‘Bange Pietje’ (Scared little Pete) is a cheerful story about a little Pete that is scared for… children. Sinterklaas (Saint Nicholas) is very surprised when he learns that there’s a Pete who is scared to throw peppernuts at children and shake their hands. He admits that he himself is scared sometimes for scary things like high roofs, strict school teachers and children pulling his beard. He teaches Scared little Pete a trick that changes everything – even the name of Scared little Pete! To show you the exact content of the book, I’ve made another video for you to watch below (all in Dutch this time, I actually wasn’t planning on translating this review to English. But because of the blog I wrote, I thought it was best to translate it after all. Otherwise the blog wouldn’t make sense). As I mentioned above, I’ve colored three drawings. The first drawing was also the first picture of the story. One sees littlePete sitting piteous on a rug. I actually find it resembling a flying carpet haha, and I think Pete wouldn’t mind to fly away on it, since he was that scared! I’ve colored this drawing with Tombow Dual Brush ABT pens. I can’t help but like these water-based markers very much. The paper was very cooperative, which was nice. I did color the white flowers in the (pyjama?) jacket first with a white Faber Castell Polychromos pencil, as well as the white of his eyes. With a skin tone Polychromos I’ve colored the face, the hands and the feet. And that stayed that way, until I had finished drawing number three. I had given that one a ‘white’ skin too. But when I had finished them, they didn’t look as a real Pete to me. It was a kind of a faker, a wannabe Pete. So I took a dark brown Polychromos and covered the skin of the face, hands and feet on both drawings. That way he was at least a real Black Pete! But on the first page still a scared little black Pete. In drawing two the solution of Sinterklaas is given. I’m not going to explain it, you’d just have to buy the book yourself and read it (okay, it’s in Dutch, but the pictures say it all 😛 ). But it’s a creative solution. I’ve colored this drawing with the Faber Castell Polychromos colored pencils. To put a little extra effort in it I’ve done some blending of colors. It’s a fairly simple drawing, but it still was one that kind of appealed to me. Especially since you can use nice bright colors. The glasses with the ships is my favorite. The transition from light to dark, like the sea, was nice to do. That way they became a kind of deep sea glasses. In the other glasses I’ve been playing around with the pressure that I’d put on the pencils. Some parts I hardly used any pressure in other parts I’ve used a lot of pressure which gave more staurated colors. The last drawing that I colored for this review, was also the last drawing in the book. Pete is no longer a scared little Pete. 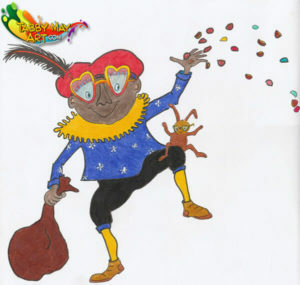 The solution of Sinterklaas helped him face his fears and now he walks happily among the children throwing peppernuts and candy at them. I’ve used the Bruynzeel Expression Colour pencils to color this drawing. I used the same colors again that I also used on the first page, this way making little Pete well recognizable. This definitely is a nice picture book for children, with a compelling, obviously moral, story. The paper is very good for coloring, so children will love working in this book with colored pencils, felt tip pens or crayons. If you’re English speaking but for example are living in the Netherlands or Belgium, why not join this lovely Sinterklaas tradition and buy this book for your child or grandchild? You can order it for € 6,99 through Bol.com by clicking here or below on the picture or link. But do it quick, December 5th is the big day! All pictures from this review can be seen here in a larger size (or through the Photo gallery in the top menu). Did you like this review? Then please share it on Facebook and Twitter. Thank you! 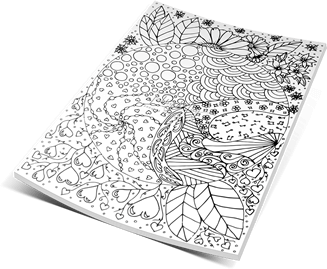 Next: Coloring for children or adults? My way of writing reviews! 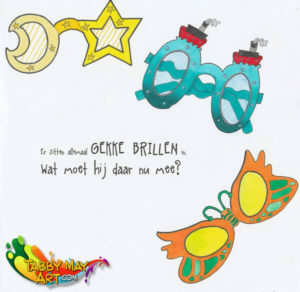 Zelfs van een kinderboek weet jij een leuk verhaal te breien…uuh… kleuren dus!